Your information has been forwarded to the Admission Office and someone will reach out to you soon. Thank you for your interest in Darlington School! Thank you for your interest in Darlington! We look forward to learning more about you and your interests so that our admission team can provide the best possible experience as you explore whether Darlington is the right fit for you. Once you complete this form, we'll send you more information and a member of our team will follow up with you. We can't wait to get to know you and your family! Choosing the right school is a big decision and we are glad that Darlington is among your top considerations. Now that you've done your homework, it’s time to take the next step. Join Darlington School for some Food for Thought! We know you’re busy, so we’ve decided to make it as easy as possible to learn more about Darlington School in Rome, Ga.
Our pre-K to 12 day school program offers an unparalleled, child-focused education, but don’t just take our word for it. Be our guest for lunch and get a taste of Darlington. You’ll enjoy a casual visit with current parents, administrators and admissions; learn about options for tuition affordability; and discover why Darlington students graduate with the confidence, connections, and compassion they need to succeed in college and their career, and be meaningful contributors to the greater good. 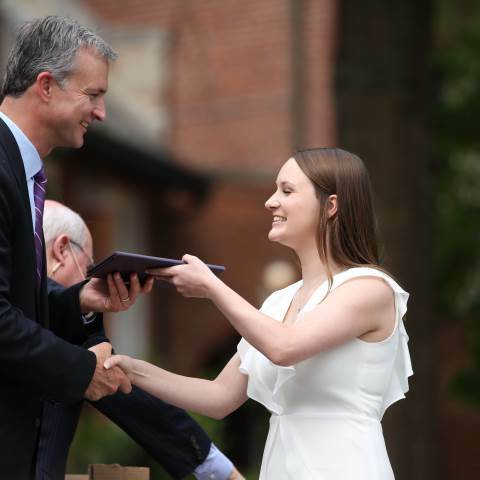 Choosing the right school is a big decision -- one that will shape the course of your child’s life -- and we hope that this will be the first step toward considering Darlington School as an option for your family. Simply choose the event you plan to attend from the checklist below, fill out the brief registration form, and we’ll see you soon! If you can’t make it to one of our Food for Thought lunches, click here to schedule your private campus visit anytime or to sign up for one of our upcoming open houses. Choose the Food for Thought lunch that you would like to attend. All events begin at 11:30 a.m. and will last approximately one hour. Note: You will receive an email confirmation upon registering and will have the opportunity to choose your lunch entree in advance. If you are interested in scheduling a private visit, please provide your preferred visit date. An admission representative will contact you to help schedule your visit. Families that attend our open houses will experience campus life, including a tour, class time, a panel discussion with current students and/or faculty, and time with the admission staff. Prospective boarding students will also stay overnight in the dorms. No upcoming events are scheduled, but you may still arrange for a private visit. Provide a preferred visit date above and then complete the remainder of this form. Monday, April 29: Thurston's Cafe, Calhoun, Ga.
Tuesday, April 30: Taverna Grill, Cartersville, Ga.
How did you hear about Darlington? The online application is a process that requires creating a user account with us. This will allow you to work on the application over multiple sessions as well as to return to check on its status. You will log in using the primary email address provided above as the username along with the password below. This password should be 8-20 characters long and contain at least one of each of the following: uppercase letter, lowercase letter, and symbol.